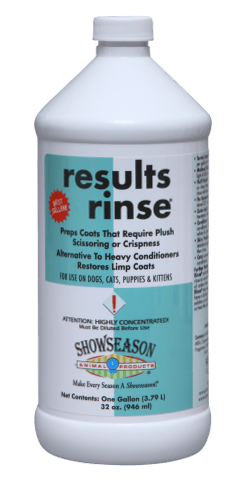 ShowSeason Results Rinse citrus-based finishing rinse that gently acidifies skin & coat to produce maximum crispness and body. Removes any product residue and will "lock-in" any type of color application. Perfect for Poodle and Bichon coats. Dilutes 64-1.